The 2017 LA Calendar Motorcycle Show continued its now 27-year tradition as the premier outdoor street bike event in America at two exciting dates and venues this year. Each Event featured top Celebrity Custom Bikes & Builders, selected Vendors and Exhibitors, Live Music performances. And the world premier of next year's new 2018 FastDates.com Motorcycle PinUp Calendars featuring the world's top Sport and Custom Motorcycles with the beautiful Calendar Kittens in attendance at the Show. Select Builders and their Bikes were be invited to be photographed by producer Jim Gianatsis for the next FastDates.com Calendars. 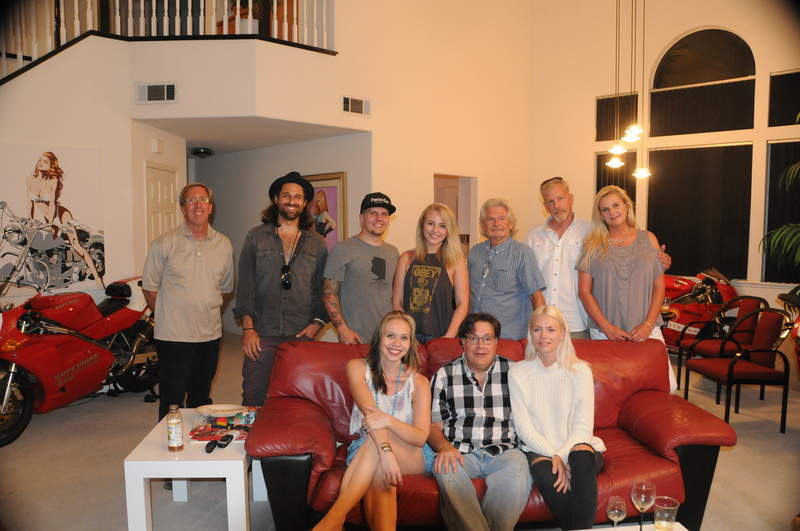 Meet the Calendar Bike Builder Party Crew! From left: FastDates.com Calendar producer and photographer Jim Gianatsis with Sara Balint, Mikuni Carburetor sales manager Steve Webb, Brittni, Mikuni Carburetor and Calendar Show marketing assistant Lee Chapin, and Jim Giuffra of AFT Customs. 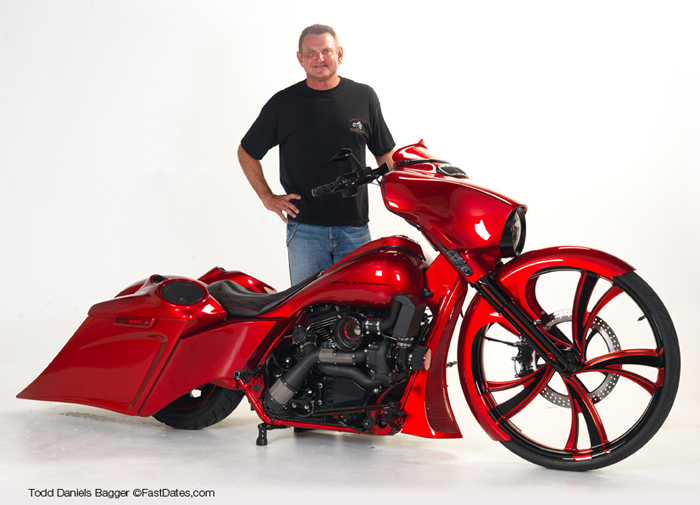 Earning a special invitation to the Party and Calendar shoot was local custom Harley enthusiast Todd Daniel with an incredible jaw dropping Candy Apple Red custom Bagger built for him by BX Custom Design in Gastonia, North Carolina. Todd himself is an Insurance Agent and Financial Consultant at his own company, TBD Insurance Services, Woodland Hills, CA. "I chose BX Custom because of their reputation and the tremendous number of great builds they have down. 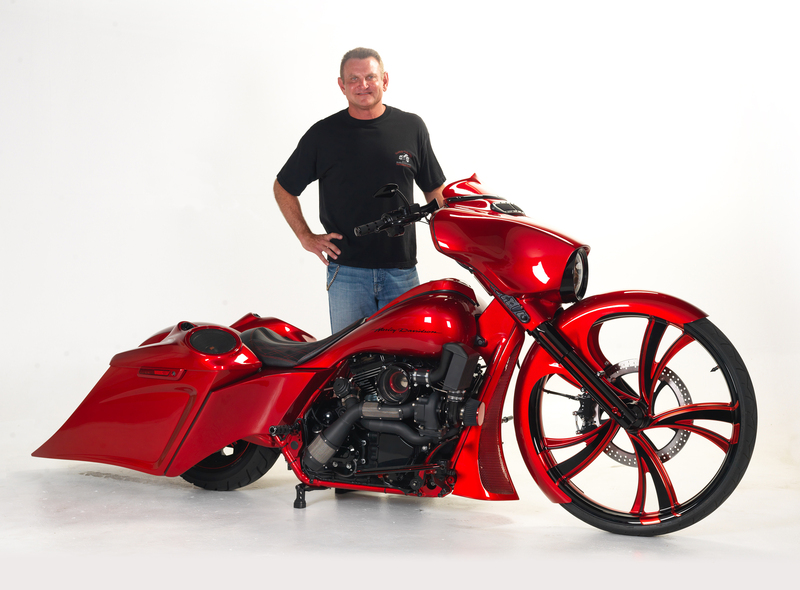 I wanted the newest, baddest bagger they had ever made, so we sat down and decided on all the components, color and design before even starting the build." "My two biggest priorities were the Candy Apple Red paint, ,the 30-inch front wheel, and a turbocharged engine - and they came through!" The engine itself is a 103ci Evo Big Twin with a Black Trask Assault Turbo Kit that is guaranteed to haul the baggage. The Flat Black engine paint really makes it look just as mean as it is, with just a few Stainless Steel bits to make it pop out. In 2014 the Calender Show found a more affordable and beautiful location as it move to at the Malibu Gold Course in the Santa Monica Mountains near the Rock Store. Vendors numbered 22 with a paid attendance now down around 500. Following the Show that year the Malibu Golf Course announced it would close for 2 years for a major renovation. It would later declare bankruptcy and close for good, probably in part because the long running California draught made in cost prohibitive to water a small private gold course. This required the Show to move again to a new venue in 2015, this time being the popular biker weekend hangout in Calabassas again, this time at the Sagebrush Cantina. The Show remained at the Cantina for 2 years until 2016, but attendance continued to decline. One of the biggest changes and challenges from the 2008 recession which really impacted paid admission events like the LA Calendar Motorcycle Show was that local motorcycle dealers became very aggressive in trying to draw potential customers to their dealerships on weekends. Many dealers began holding Open House events in their parking lots on the weekends with free live music, free food and beverages, vendors and demo bike rides. Plus the internet with its free content of motorcycle pictures and information, pretty models, and product vendors has impacted attendance at paid motorcycle events as well. These two factors, free competing events by dealers in Southern California and free content on the web, has became the big challenge for the LA Calendar Show, that even its exclusive featuring of many the world's top custom bike builders with their latest custom bikes, beautiful Calendar models, and top name female performers can not overcome. 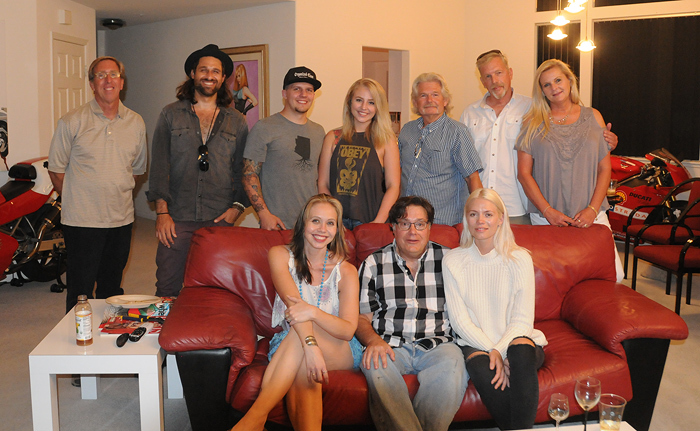 For 2017 Jim Gianatsis moved the Calendar Show on Saturday July 15th to his home studio in Woodland Hills, and invited his favorite Calendar Builders and singers to come for a calendar Shoot, Concert and House Party. And then on October 15th would partner with long tome friend and Calendar Bike Builder Russell Mitch to hold a 2nd Show at Paramount Western Movie set in Agoura, CA. For now, FastDates.com Calendar photographer and Calendar Show producer Jim Gianatsis will continue the Show as an annual tribute to the world's top custom bike builders and beautiful models and music performers in support of the FastDates.com Motorcycle PinUp Calendars. It may return full circle to that back yard BBQ at Jim's house where it first started some 25 years ago, but it will continue. And hopefully the industry and motorcycle enthusiasts will still want to be a part of it. Jim seated on the couch with favorite singer songwriters Alex Nester and Helene Himmel aka Lenachka. builder Richard Jones, motorsports photographer Brian Mayfield and his wife. Our favorite Calendar shoot MakeUp and hair stylist Victoria Rubell works on Sara Balint's hair in the office. While in makeup for the day's shoot, Sara looks at her pictures featured in the 2012 Garage Girls Calendar. An incredible day of live Calendar Girl Music featured American Idol contender Alex Nester and her band performing two exciting sets of rock classics and her own original songs. Alex also serves as vocalist and keyboardist in the band of legendary guitarist Carlos Santana and his son Salvador Santana. Also performing was incredibly talented 22-year old singer songwriter Lenechka. Sara and Brittni with Richard Jones' newest custom, a retro British themed cafe racer with a springer front end and a modern Harley Evo engine. Richard is not a professional builder, and this was just his 2d ever build for his own collection. His first custom build was an aluminum framed Harley custom which won the Street Custom Class at the 2015 LA Calendar Motorcycle Show, and is featured in the 2018 Iron & Lace Calendar. Lenachka sings at the Calendar Bike Builder Party. Click to view her music video below. Sara shoots with one of two beautiful customs which Ron Simms sent to the shoot. Jim jumps in for picture with Calendar Kitten Sara and Ron Simm's other bike at the shoot, a classic '60s Pan Head. 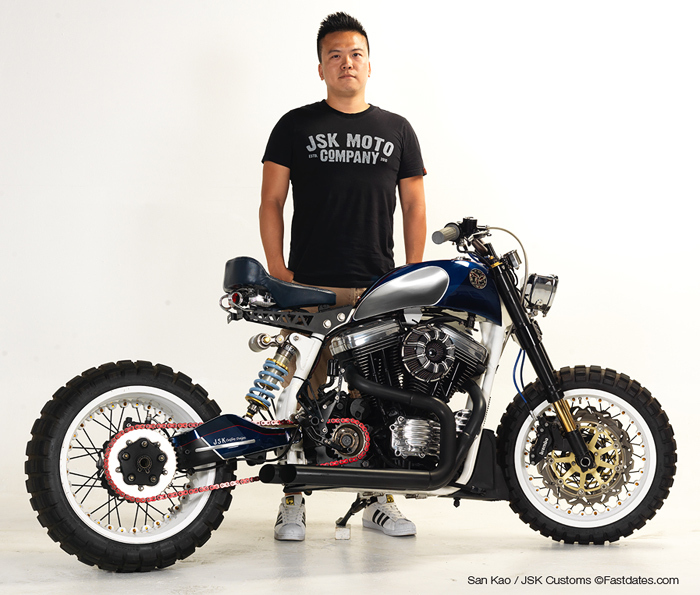 Sam Kao of JSK Custom Designs brought his latest build, a monoshock Harley Evo off-road racer! Jim and Sara with Jim Giuffra / AFT Custom's latest build, a Honda CL350 with a single shock rear suspension and customized to Cafe Racer styling. Alex Nester is the singer and keyboardest for the legendary Carlos Santana. 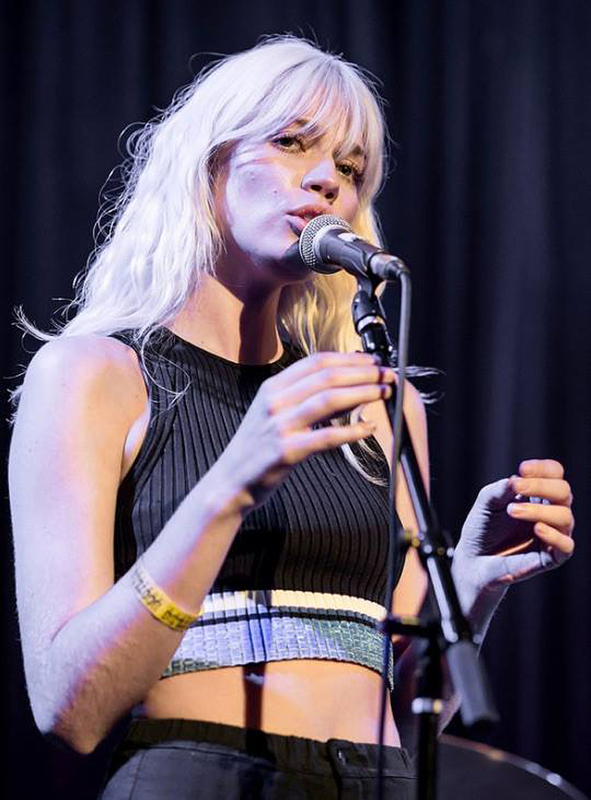 She also performed at our 2016 LA Calendar Motorcycle Show. 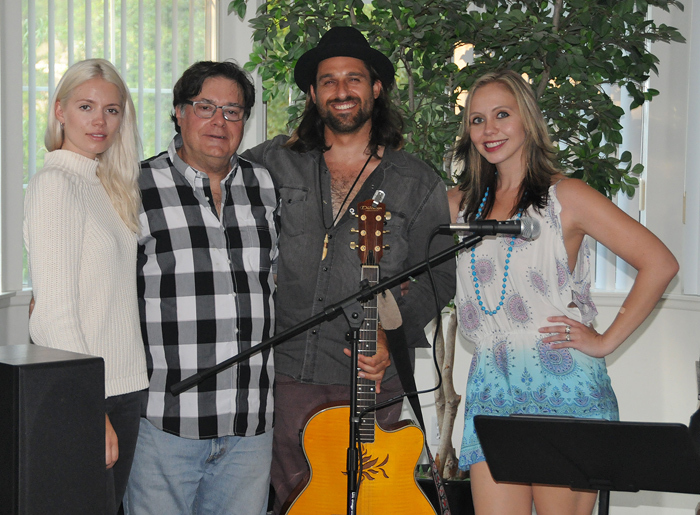 Jim Gianatsis with Lenachka (left) , and Alex Nester (far right) and her guitarist. for your company's advertising design, editorial and photography service needs. Then in year 2008 with the economic collapse which started on Wall Street and spread across America and around the world, many people no longer had the disposable income to spend on expensive toys like custom motorcycles, even motorccyles in genearal, and many custom bike companies and aftermarket parts companies were soon out of business.